For those among us who have lived through the second half of the 20th century, gradually realizing that the Iron Curtain has fallen and that the Cold War ended without military confrontation is a liberating relief, how later generations will hardly be able to imagine. In shopping malls across America, pieces of the Berlin Wall are sold as souvenirs. The price runs $10.00 a piece. They are handed out wrapped and with a warranty to make sure that these pieces of concrete and plaster are genuine. They sell well. Why are people buying them? They buy them in part out of a craving for sensation, but also because they desire to have a token in their hands of an extraordinary historical event. 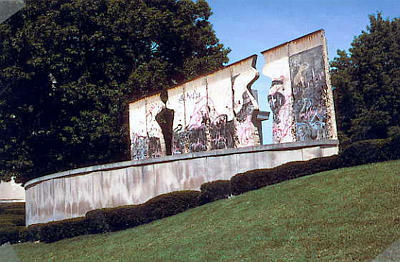 [A big chunk of the Berlin Wall stands on the grounds of Westminster College in Fulton, Missouri, about 100 miles west of St Louis. How this large piece of the Berlin Wall has come to Fulton, is preceded by a long story. Westminster College established in 1937 the John Findley Green Foundation Lectures, which invite annually a prominent speaker to address a topic of international interest. Winston Churchill was invited for the year 1946. As the renowned College was located in his home state, President Harry S. Truman supported the invitation and promised Churchill that he would accompany him to Fulton and introduce him for the lecture. The speech, which Winston Churchill delivered at Westminster College on March 5, 1946, titled �The Sinews of Peace,� entered post-war history as the �Iron Curtain Speech.� Churchill was addressing audiences in America and in Europe. He called attention to the great danger that was threatening peace. His speech culminated in the sentence: �From Stettin in the Baltic to Trieste in the Adriatic, an iron curtain has descended across the Continent.� And he pointed out that the historic capitals of Central and Eastern Europe lay behind that line. Churchill�s speech was covered by the news media on both sides of the Atlantic. From then on, the expression �Iron Curtain� has become common usage, synonymous for the Cold War. In memory of that historic speech, Westminster College established at the beginning of the 1960s the Winston Churchill Memorial and Library. Today, on the Human Rights Day of the United Nations, Czechoslovakia achieved, for the first time in 40 years, a government, in which the Communists are in the minority. This strengthens the awareness that the days of repression, of flagrant disregard of human rights by a police state based on Marxist doctrine are finally over. The Ceausescu regime in Romania stubbornly refuses to give up its Stalinist course. Using brutal force, over the weekend demonstrators were indiscriminately shot at. The number of fatalities could go into the hundreds if not thousands. In spite of it, also in Romania the movement for democracy cannot be stopped any more. Following the bloody conflicts in Timisoara and Bucharest, Nicolae Ceausescu resigned. Ceausescu and his wife Elena fled in haste from the government palace. Although Ceausescu had gone his own willful way within the East Bloc, as Stalinist he has ruled Romania with a tight grip since 1965. How brutal and dictatorial his regime has been, has still to be uncovered. At this time, the supporters of Ceausescu and the liberation army in Bucharest are confronting each other in bloody street battles. The events in Romania serve as a warning example for what could have happened in the other East Bloc countries. The more surprising is the �velvet revolution,� which, in recent months, has spread all over Eastern Europe and moved without bloodshed in the direction of democracy. Despite the civil war and the confusion throughout the country, Christmas trees were lit in Romania. Christmas was celebrated in public, which, for decades, had only been possible to do in secret. Washington is giving more and more the impression of a real capital, although its character of being strictly a government administration center has been maintained. The city renewal of the past ten years has given Washington a refreshing face-lift. The old and the new museums attract millions of visitors every year from all over the world. Also, the impression has increased that one is in the center of a world power. The liberation of Eastern Europe from Communist dictatorship was like opening a big prison. It should never be forgotten that gaining freedom was the highest aspiration and greatest good to achieve in the extensive democracy movement of this eventful year.